Ibérico de Bellota Chorizo for sale. Buy online at Zingerman's Mail Order. Gourmet Gifts. Food Gifts. Ibérico pigs are a heritage breed that roam free in the oak forests in southern Spain. In the autumn they gobble up acorns (called bellotas in Spanish) as quickly as they fall from the trees. They’ll eat up to 20 pounds of acorns per pig per day. The acorn diet creates incredible fat that melts in your mouth in a way that seems completely surreal. The most famous example of the meat is the incredible dry-aged Ibérico de bellota ham, but that’s not the only way to experience it. 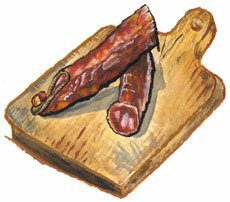 You can seriously up your snack game with Ibérico de bellota chorizo, Spain’s mildly spicy paprika-spiked salami. It's ready to slice and eat right from the package. A few nibbles make a great start to a meal with some flavorful crackers and nutty cheese. It would be downright decadent on a picnic or hike. The texture and flavor are remarkable. Tasting Ibérico de bellota meat is something we should all experience at least once in our short carnivorous lives.